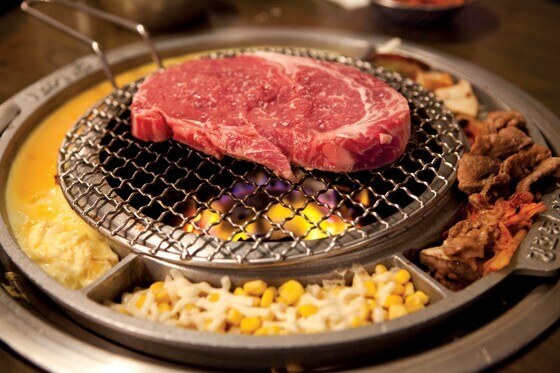 How do you have multiple locations in the country and still be considered the best in a city as rich in Korean barbecue options as Los Angeles? Well, you own the blueprint for success. Start with excellent meats, like that flawless marinated short rib that gets just a little burnt on the edges to give you a crust with every bite, or that snappy pork jowl that’s equal parts tender meat and an explosion of pork fat. Add minimal sides, like steamed egg, corn cheese, and some pickled veggies and dipping sauces. Put it in an old-school Korean environment to invoke a nostalgia of the old country, and be consistently good, every time, whether you’re in Los Angeles or Buena Park, and yeah, it’s not hard to see why it’s the best. The fact remains that regardless of expansions, there is no more essential a Korean barbecue experience than the one at Kang Ho Dong Baekjeong. Quarters might be next door to a serious heavyweight in Kang Ho Dong Baekjeong, but it’s proven to be a serious contender in its own right. Excellent quality meats, a modern-looking space and, oh yeah, a full flippin’ bar gets Quarters high marks in the “just here to have a good time” category.